One thing I have personally found at fault from the mixes of Chris Fortier is that although the mixing is always spot on and fantastically put together from start to finish, it's the track selection that has let me down from time to time. His 'Bedrock' mix is perhaps the best I have heard from Chris taking into account mixes such as 'Atmospherics v1' and 'Trance America', and although Bedrock is quite good, I feel Chris hasn't delivered his best on the mix compilation circuit. 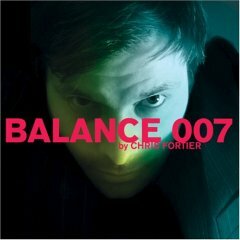 When the tracklisting to Balance 007 landed in my Inbox, it immediately appeared to me that perhaps Chris had, for me at least, nailed the track selection. It was a premonition that soon came to fruition once I had heard the 3 mixes (yes 3 discs! ), that Chris had delivered. This is quite simply the best Fortier has displayed on CD, and it is by far the most diverse mix Fortier has put together in his veteran like impact on this wonderful Electronic music scene. Disc One begins in fantastic fashion with 'The Deep' by Global Communication. The first disc really does flow nicely early on with some pretty crisp and surprisingly quirky beats, creating a quite techy first half that includes highlights from Error Error with their quirky riffs Alex Smoke with his deep chunky baselines and tripped out percussion. The bouncy 'Sella Dor' by PJ Davy lifts the pace up a little in the middle section of a disc that has oozed in the finest of chunky tech house. Expect the usual high quality from Agoria with the sinister yet somewhat funky 'Klub', and the smooth driving house continues with the delicious baselines from Linus' remix of Lindos & Moth. Fortier continues to drive the mix with some quality chunky driven tech from the likes of Kobbe & Nitro and one of the more recent works from Rabbit In The Moon with 'Timebomb'. The Wighnomy Dub of 'This World' by Slam boggles the mind a bit as the mix gets a little quirkier towards the latter stages. D Diggler turns up the heat with a gritty electro baseline - definitely none of this crappy nonsense electro we have been saturated with lately. !!! (Chk Chk Chk) close the mix off with an absolutely evil baseline smother monster of a tune. Nasty stuff that leaves you gasping for more! Disc Two on the whole is a little more minimal but the flow and build to the mix is absolutely fantastic. The Claro Intelecto remix of 'Futures In Plastic' by Vector Lovers is an absolutely stunning combo of sounds and smooth cluttered beats, and it sets the mix up very nicely early on. Matthew Jonson creates another delightfully smooth production early on with smooth flowing pads and a subtle soothing atmosphere. The tempo lifts a notch with the swirling stabs of 'Cooling the Plasma' by Rene Breitbarth and the intensity continues with the subtle vocals and gritty b-lines of 'Usage' by Connors & Kingler. The mix to this point again has a techy edge to it, but the drive is noticeably stronger then that of the first disc. 2 Dollar Egg unleash some subtle Arabic vibes in 'Naxos' while 'Get Lost' by Nicholas Wood is somewhat hypnotic with its eerie effects and pulsating pads. Floppy Sounds feature with undeniably a stunning highlight to the mix while the pace again lifts up another notch with the chunky driving baselines and melodic synths of 'Con Fusion' by Patrick Zigon & David Phillips. Two tracks by Lucas Rodenbush help set up a frantic yet somewhat smooth conclusion, and the final track, that being Micah's gorgeous remix of 'As You Fall' by Bent is as good a conclusion to a disc as I have almost ever heard. Stunning to say the least, with the fantastic vocals and summery melodies closing the mix in pure style. The bonus disc is by far the quirkiest disc of the lot. It begins with the retro sounds of Sinewave and continues in a retro vein early on with productions from the likes of Leigh Dickson and Anthony Rother. There are snippets of acid with 'Ocean' by 2 Rare People, and the disc continues to step up the tempo with juicy cuts such as Mr Velcro Fasteners melodic funk remix Hardfloor's 'Skillshot'. Eddie Richards delivers a somewhat evil production in 'Dark 13', but it isn't the only sinister taste that features on this disc as the dark gritty baselines of 'My Truth' by Funk Harmony Park get the disc peak time, equipped also with a set of swirling melodic riffs that are quite brilliant. It is by far a great highlight to this bonus disc and it is followed up in worthy fashion by the somewhat funky sounds of 'Raio' by Ramiro Mussoto. The mix ends in an unusual fashion with the acid baselines of 'Crackhousewarmingparty' by David Gilmour Girls, a track that features intense effects and unique vocal riffs. One thing this release will definitely do is grow and grow with each listen. The mixing is as usual from Chris, absolutely spot on, and it works fantastically well with the tracks he has chosen. Each track builds and builds on the one before it, and the first two discs especially showcase this. The album doesn't really feature any obvious anthems as such, but you soon come to realize that the result of this is a great depth that will keep you wanting to listen to this album more and more. The flow is reminiscent of some of those classic Digweed & Sasha GU albums. The variety is also an added bonus, with smooth House productions combining well with minimal tech tracks, melodic progressive and some driving electronic. It's not one of those mixes where you will be finding that some tracks are great while others ruin the mix, on the contrary, you will find that the mix, and again I stress mostly the first two discs, blend together to deliver a better rounded mix. The bonus disc is thankfully quite a contrast as it breaks up the flow and delivers a mix full of surprises and even quirkier moments. As a package I must say it is probably the best in the Balance series, and even better there are three discs to keep you occupied and aurally stimulated. It is another fantastic mix to hit the shelves in 2005 amongst a few others.